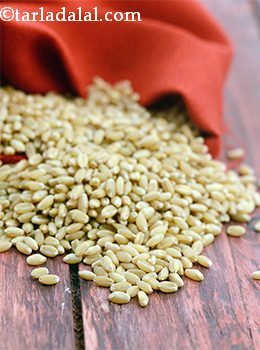 Also known as Gehun, wheat is one of the most common cereals used throughout the world. It is also one of the most valuable cereals and a good source of energy. Wheat, in its natural unrefined state, features a host of important nutrients. Therefore, to receive benefit from the wholesomeness of wheat it is important to choose wheat products made from whole wheat flour rather than those that are refined and stripped of their natural goodness. The glycemic index of wheat is 54 which puts wheat into low GI category. Is wheat safe for diabetics? It is very important to monitor your blood sugar levels when you have diabetes. Therefore it is important to keep a check on the type of food you eat. Wheat is an excellent source of carbohydrates. Carbohydrates raises blood sugar the most. It contains 21.3 grams of carbs in 30 grams of raw wheat (approx. ¼th cup). This is best understood by the glycemic load which is 11.5. The more carbohydrates in one serving size of ingredient, the more is the glycemic load. Hence it is mandatory to control your portion size. Always remember have your cereals which is rich source of carbohydrates along with protein and fats as they tend to reduce the overall GI of the recipe. Prefer combining your cereal with any other pulse, thus making a complete protein. Wheat is an extremely rich source of magnesium (41.4g of magnesium in 30 grams of raw wheat) which improves insulin response, thus manages blood sugar levels. Is wheat suitable for weight loss? Wheat is an excellent source of carbohydrates providing maximum energy out of all food groups. Hence it should be combined with other food groups such as protein and fats. Include lot of vegetables with it makes your meal rich in fiber. This make you feel satiated even though calorie intake is less. Thus controls your appetite. Remember to have small and frequent meals every 2 hours instead of having one large big meal at a time. Plan your diet wisely.